W. Lee Andrus, FCO2/c, born June 30, 1925, Troy, KS. 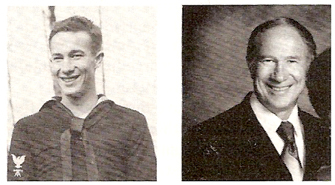 He joined the USN Nov. 29, 1942, at Inglewood, CA. Boot camp was at USNTS at San Diego, CA. Attended Fire Control School at Treasure Island and rated FCO3/c and assigned to the USS Lexington (CV-16) at South Boston Navy Yard (plankowner). Participated in Tarawa Raid, Sept. 19, 1943; Wake Island raid, Oct. 5-6, 1943; Tarawa invasion, Nov. 20, 1943; at Kwajalein on Dec. 4, 1943, took a torpedo hit from a Jill torpedo bomber, then went to Bremerton, WA for repairs. Transferred to the USS West Virginia (BB-48) and made FCO2/c; went to Leyte Oct. 17, 1944, for the invasion. Watched MacArthur wade ashore via powerful rangefinder optics and watched main battery put 93 rounds of 16-inch shells into Japanese battleship Yamashiro, Oct 24, 1944. Went to Mindoro December 15 for invasion; run up the Sulu Sea and the South China Sea on the way to Lingayen Gulf. It was a kamikaze nightmare. Entered Lingayen Gulf Jan, 6, 1945 for the invasion; Iwo Jima invasion, Feb. 16, 1945; Okinawa invasion, March 23, 1945, and was in Tokyo Bay for the Japanese surrender and watched MacArthur and the Japanese sign the peace treaty via powerful rangefinder in Sky #4. Mustered out Dec. 24, 1945, at Terminal Island, CA. His awards include the American Campaign, Asiatic-Pacific Campaign w/7 Battle Stars, Philippine Liberation Medal w/2 Battle Stars, Occupation Medal, Victory Medal and Presidential Unit Citation.